The other book I've been reading this week is Hanging On, Frances Partridge's diary of the three years following her husband's death in 1960. It's horrifying really how much I identify with the life and the feelings she describes. Have I lived the whole of my adult life in mourning for a soulmate I never had? "What has surprised me is that just because the blow has been so mortal, as if roughly, savagely, cutting me in half and leaving me with one leg and one arm only, I am with what seems to me total illogicality struggling frantically to survive... The life instinct must be much stronger than I know. "...I think the impulse to write here is perhaps salutory, a first attempt to let up the terrifying, iron clamp which I have fastened on my thoughts." Such passages are scattered through a book that is full of life and travel and sociability, keen awareness of local and global realities and lively description of people and places - and all more poignant for that, of course. "Why publish something so unbearably sad?, I may be asked. Because virtually all adults learn sooner or later that there is a great deal of sorrow in life, that it is interrupted by disasters and crushed by stresses; that death and bereavement come to everyone and have to be faced. But most also know that it is not all sad, that in its very essence lies something glorious and splendid, that the stuff it is made of arouses constant wonder and interest, that even when one cannot stop crying one must suddenly laugh." It is all the more poignant, too, for knowing that this woman who clearly - feeling half-alive in her bereavement - thought she might not survive her husband for long, was to live another 40 years and die in 2004 not long before her 104th birthday. Most poignant of all because the diary ends on a note of hope with the birth of her grandchild and I read it in the knowledge that a further, cruel and completely unexpected bereavement was to come, that her son collapsed and died, still in his twenties, when the baby was a few weeks old. A terribly sad book. But also redemptive, for she lived those long years that were still to come after losing her husband and then her son, and lived them well, busy and well loved, published many literary translations (the work that kept her going through this sad time) and later many volumes of her diaries and became, as she outlived all the other members of the 'Bloomsbury Group', an increasing focus of interest and admiration. Perhaps it isn't really her account of bereavement that I identify with at all. Perhaps it's more that what she experienced and wrote so well about after losing her beloved partner of thirty years was a particularly acute perception of what life is always like anyway, but a consuming relationship or activity may sit squarely in our central vision and obscure it. She saw, and convincingly conveyed, what Terrance Keenan also saw: we are always nadie, nobody, and it's always winter. But perhaps this is not quite as bad as we think, quite as bad as we fear. So life has been hard lately – more like mid-winter: out of season, out of synch, like this carpet of summer white. But a time of valuable lessons, perhaps, and the hardest lesson for me the one that’s always hardest and has endlessly to be repeated: how not to withdraw and curl up inside my snail-shell, but stay present when things are tough, stay in my place and keep doing what I can, however inadequately. 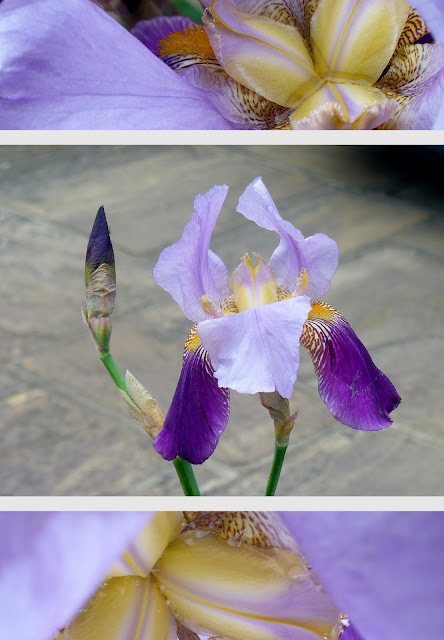 Resisting the constant temptation to declare defeat whenever I feel exhausted, overwhelmed, overwhelmingly negative, I have stayed, and it’s largely been ok – surprisingly ok, really. Somehow, when I was growing up, I never learned that where we mostly have to live is in a desperately messy mid-ground, so far from perfection, so far from what we think we ‘need’, but not necessarily disastrous either. I guess my parents were so deeply unreconciled to their lives that they weren’t able to model this. “ Intellect raises the questions, but it cannot answer them. It is life itself that resolves them. One has to be open to it, allow it to be blameless..."
Hey, a mural has materialised just up the road - I love it! After work last night, I walked down to the National Portrait Gallery to see the annual BP Portrait Award exhibition, which opened this week (yes, I did hear a Radio 3 arts pundit asking someone from the gallery if long-term sponshorship was at risk). Saw a lot of fabulous technique and some very interesting concepts, but nothing that absolutely grabbed me. To be fair, though, last thing on a very, very tired, hot Friday, I'm probably close to ungrabbable. Looking at portraits did have an effect: coming out into the still bright evening, my eyes kept framing pictures. I've never been one of Julia Cameron's many, many fans. Her books just didn't 'do it' for me, though they clearly do it for many artists and would-be artists, and I applaud her project. So I was quite surprised to find myself picking up a book of hers in the bookshop at Tate Modern, where I went to see an exhibition recently. I was wide open, full of thoughts and reactions after what I'd seen (which I hope to write about), so I felt I should trust my instinct and buy the book. And The Sound of Paper proved to be the one of her many books which was written for me. Page after page of it resonated, felt meaningful and relevant. For this little book addresses what I'm feeling right now - what to do when you're feeling at point zero, ground to a halt, having to start again from scratch.
" When we are at zero, we have to start somewhere, and perhaps the sanest, best, and surest place to start is with the eye of the beholder. We are in a certain place at a certain time and we feel a certain way about it. Let's start here. That means put the pen to the paper and write about the exact moment and place where you find yourself. ...We do not arrive willy-nilly at point zero. we arrive there a choice at a time, a degree at a time, as we make little or less than we should of a growing discomfort. We get along without what we love the way camels get along without water - not forever, but for a very long time. And then, one day, we are thirsty and what we crave is water, real water, a pure infusion of something that matches what our body and soul are authentically craving. ... the first act of loving kindness is to start from scratch - the scratch of pen on paper. the filling of blank pages with our specific likes and dislikes, our heartfelt and regretted losses and sacrifices - this is the beginning of being someone and somewhere again. When we ignore ourselves for too long, we become exhausted and weakened from trying to get our own attention. We become disheartened - without heart. " So, having felt disheartened for a while, I'm attempting to start from scratch (if not the scratch of pen on paper). Decided to join the Summer of Genji reading challenge. 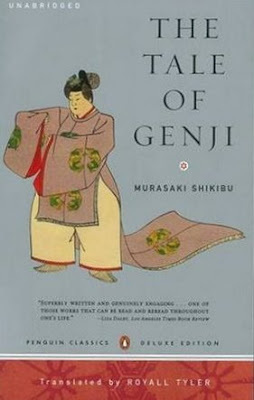 So far, it's intriguing and very readable, but there's a major snag: The Tale of Genji is a great, fat, 1000-page paperback that's more than two inches thick and weighs a ton - not good for hauling around in my bag and reading on the bus! Looking out over the river from a balcony at Tate Modern. And a very thought-provoking piece from Ajahn Sucitto on self and self-presentation. Sheesh. How did that much time go by? it was a good day, though. I took the day off and, having lain down all morning, my mind actually woke up and said things other than 'I am so tired, please let me lie down!'. What next? - suburban shopfront: closed, repainted and awaiting its next incarnation. Rather pretty with the pattern of patches, light and the tree shadow. And weighted, of course, with symbolism. It's cold and raining. My steps squeak and squelch on the pavement, each one reluctant. Look, look into the heart of things, the sweet centre where it never rains, is never cold. I love the way that, through the always inter-referential human gaze, the patterns in nature recur and echo one another in the most surprising places. Like the tiger-stripes of the iris (tiger in a mauve bonnet?). Like looking at Marja-Leena's photos of wet sand and seeing the dripping hide of an elephant. I am staggering in my life lately, as I often do, feeling overwhelmed physically by exhaustion and mentally by my sense of inadequacy and failure. This is not an uncommon feeling, I think - the way a lot of us live in a Western city in 2010 must make many people feel this way, and the figures for mental illness and other clearly stress-related illness show that many are worse affected than I am. There are a few things that help: keep breathing, just the next breath; keep trying to hear and see other people clearly and treat them with kindness (this can feel like an extra pressure, but, as well as helping not to push up other people's stress levels, it actually helps me too by adding warmth and calm to the surrounding atmosphere instead of more tension); keep looking not just inside myself but at what's around me, the weirdness and wonder of people, of the vestigial natural world surviving in the city, of everything; keep trying to articulate my perceptions and feelings, capture something of what I see. Simple things. Hard to do when feeling like a floundering fish. on the South Bank as part of her London retrospective in 2007. Seeing that retrospective - twice - was very exciting. The fierce, astonishing, angry beauty of her work made me feel alive, as do my still sharp memories of it, even now, in this very moment, when I've been so tired and ill and discouraged recently, feeling honestly closer to dead than alive. There can't really be a greater tribute than that, can there? In loving, awestruck memory.